The 108th Annual Meeting of CAMWS will be held Wednesday-Saturday, March 28-31, 2012, at the Belle of Baton Rouge Hotel, Baton Rouge, LA, at the invitation of Louisiana State University. The Belle of Baton Rouge (http://www.belleofbatonrouge.com/) is located at 103 France, Baton Rouge, LA 70802. The Belle embraces an old city block of the downtown port district. A glass roof was built over the block, allowing sunshine into the area that was the street and forming an enormous indoor atrium. All the meeting rooms are accessed directly off the atrium in restored buildings. Hotel guest rooms have free internet access and come equipped with coffee, iron, ironing board, and hair dryer. Registered guests have access to secure parking. The parking garage behind the hotel provides free parking. In addition to dining (see separate document), the Belle houses the "Famous Theater," an outdoor pool and a small fitness center (a larger workout area is available around the corner from the hotel at Anytime Fitness). The business center has a computer and printer. The hotel is connected via a walkway to the Belle Riverboat Casino, docked at the levee on the Mississippi River. For all attendees the Belle is offering a flat rate of $129 (plus 13% tax) per night. This price includes a free hot breakfast buffet each morning. To receive the special rate, you must make your reservation by midnight on Wednesday, March 7, either by calling 800-266-2692 (with the booking code "CAMWS") or by using this link https://gc.synxis.com/rez.aspx?Hotel=28564&Chain=5358&promo=CAMWS. 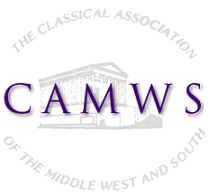 Be sure that the word "CAMWS" appears in the Corporate/Promotion Code box. The center of Baton Rouge lies at the junction of I-10 and I-12. The Belle is located at the SE corner of the downtown area at the edge of Mississippi River. Some roads in downtown are narrow and restricted to being one-way, so drive carefully. LSU Campus begins about two miles to the south of the Belle. Bus service to Baton Rouge is provided by Greyhound (http://www.greyhound.com/home). Greyhound Buses arrive and depart from the station at 1253 Florida Boulevard, 1.3 miles from the Belle. Louis Armstrong International Airport (MSY) in New Orleans (http://flymsy.com) is 70 miles away. CAMWS has signed an agreement with United Airlines for special discounts of up to 10% on United or Continental flights to and from Baton Rouge between March 25 and April 3, 2012. Travel must be for the purpose of attending the CAMWS Meeting. Booking may be done online at www.continental.com (with additional 3% discount and no service fee) or by phone through United Meetings Reservations ($25 service fee) or through a travel agency. For further instructions please see this flyer. The Belle offers a free shuttle for its guests. Call 800-566-2690 or use the Courtesy Phone Bank in the Baggage Claim Area (dial 140) to arrange a shuttle. Teachers who would like to earn 3.3 Continuing Education Units (CEU's) for attending the meeting do not have to do anything in advance. When they arrive, they should simply ask at the CAMWS registration desk for a CEU application form. Before leaving the meeting, they should return the completed form to the CAMWS registration desk, along with a check for $7.50, payable to "UW-Madison Extension." For the fifth year in a row, the Graduate Student Issues Committee (GSIC) will sponsor a pre-convention workshop, Wednesday, March 28, 6:00-8:00 p.m., in the Belle of Baton Rouge Hotel. This year the topic will be "Classroom Management." The workshop is limited to graduate and undergraduate students. Although there is no charge, please check the box on the registration form if you plan to attend. After the pre-convention workshop a free reception, hosted by the former presidents of CAMWS, will open the meeting, 8:00-10:00 p.m., Wednesday, in the Belle’s unique indoor/outdoor atrium. Between Thursday morning and Saturday afternoon there will be a dozen panels (one of them for undergraduate papers, another the Presidential Panel on "Screening Roman Myth & Literature on Film and Television"), and 60 paper sessions on a variety of pedagogical and scholarly topics. There will also be a happy hour for students, a reception sponsored by the Women's Classical Caucus, and a lunch hosted by the Vergilian Society. Friday afternoon's sessions will be held on the campus of Louisiana State University, near the home of mascot Mike the Tiger (http://www.mikethetiger.com), followed by a reception. The banquet on Friday evening will feature President Julia Hejduk's address on "Teaching in Paradise" and the ovationes for 2011-112, presented in Latin by Jim May. More awards will be announced at the annual business meeting on Saturday, 8:15-9:25 a.m.; if you show up, you may win a book from one of our exhibitors!